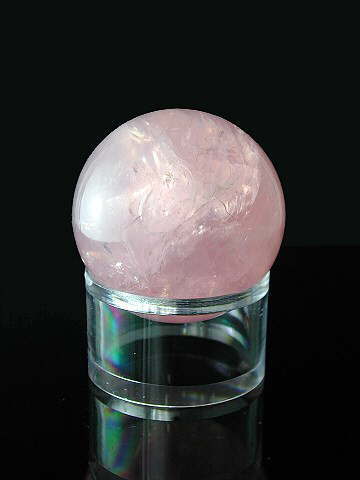 Beautiful, translucent, 'A' Grade Rose Quartz sphere. This is a really super quality sphere, with a truly lovely energy. The photo doesn't do it justice but it's a beauty! The stone of self- and unconditional love. Most of us know about the properties of Rose Quartz. It is often one of the first crystals we work with or come into contact with. Commercially it is almost always marketed as a Love Stone, which indeed it is, and has been regarded so for thousands of years with its beautiful, sweet energy, but as a crystal, it does have another 'mission'. You can read about the slightly different and deeper mission of this much loved, but often overlooked pink stone in our 'A to Z Crystal Directory' by clicking on the pink 'A to Z' logo at the top left side of any page on this site.